‘More than 5,000,000 of these biscuits made and sold every week’. So it says on the wrapper of a Tunnock’s Caramel Wafer which is made in the Tunnock’s factory in Uddingston, a small town seven miles from Glasgow in Scotland. Five million bars is an impressive number of bars. If this is made up the number of the biscuits made in a week and the number sold in a week, it’s a bit like double counting. This is a box of 48 milk chocolate Tunnock’s Tea Cakes with the rosy-cheeked face of the Tunnock’s boy from the mid-1900s. Tunnock’s, registered name Thomas Tunnock Limited, has two main lines, the Caramel Wafer and the Tunnock’s Tea Cake, both sold in milk or dark chocolate. 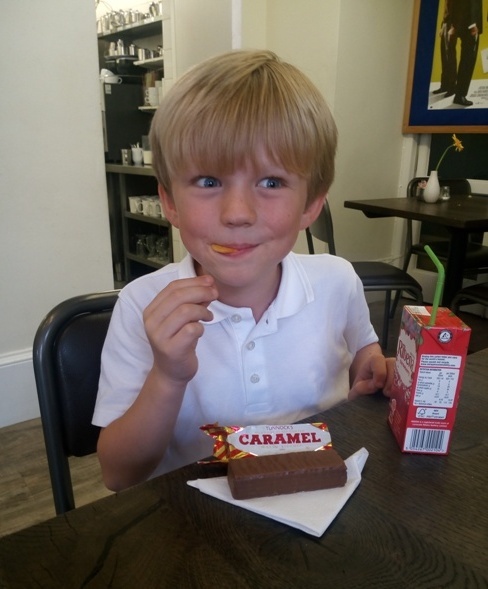 A Tunnock’s Caramel Wafer is a bar of five layers of wafer, interspersed with four layers of caramel, and coated in chocolate, made from cocoa and milk solids. The milk chocolate wafers are wrapped in red and gold foil paper, the dark chocolate variety in blue and gold. A Tunnock’s Tea Cake bears no relation to a teacake, which is a sweet roll with dried fruit added to the mix, which is usually served toasted and buttered. It consists of a small round shortbread biscuit covered with a dome of Italian meringue, a whipped egg white concoction similar to marshmallow, which is encased in a thin layer of milk or dark chocolate. The milk chocolate teacakes are wrapped in red and silver foil paper, the dark chocolate teacakes in blue and gold. Three million Tunnock’s Tea Cakes are sold and made every week. Here’s a pack of eight dark chocolate Tunnock’s Caramel Wafers. Both the wrappers of the tea cakes and the wafers are ‘dead-wrapped’, that is without glue, so the wrappers come off quickly. There are two other Tunnock products, the Snowball, soft marshmallow with a chocolate flavoured coating, and the Caramel Log, a wafer and caramel biscuit, again with a chocolate flavoured coating, both sprinkled with roasted coconut. Vans like this one were used to deliver Tunnock’s products to shops in the 1920s and 30s throughout the central belt of Scotland. Bothwell is where the factory is sited, a couple of miles from Uddingston. 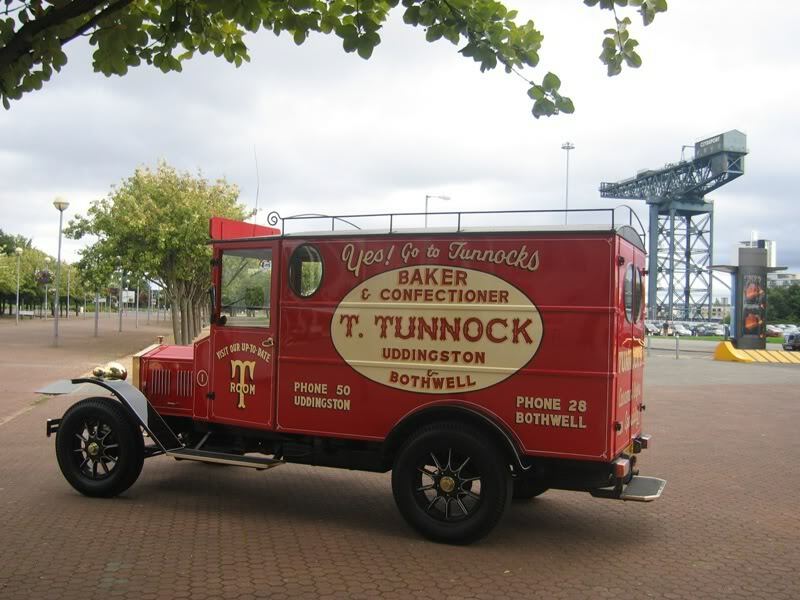 The company was formed as Tunnock’s in 1890 by Thomas Tunnock, who was born in 1865, when he purchased a baker’s shop for £80 in Lorne Place in Uddingston. The two core products were introduced in the 1950s to replace cake which used sugar and fat that was still rationed after the Second World War, and which had a short-shelf life. The company is said to be the 20th oldest family firm in Scotland still in operation. It employs 520 staff and is headed by the grandson of Thomas, Boyd Tunnock CBE. The company has resisted pressure to make own brand biscuits for supermarkets. The face of the Tunnock’s Boy appears on much of the packaging of Tunnock’s products. You can read more about Tunnock’s and the factory in Uddingston here. In Scotland, Tunnock’s Tea Cakes have an iconic status, possibly evoking memories of childhood or symbolising ‘home’ for Scots around the world: the company exports to 30 countries, the biggest being Saudi Arabia. Factory tours are so popular that the there is a two-year-long waiting list. It is said that the Scottish National Blood Transfusion Service gives Tunnock’s Tea Cakes to blood donors after giving blood. Dundee University has a Tunnock’s Tea Cake Appreciation Society and St Andrews University in Fife has a Tunnock’s Caramel Wafer Appreciation Society. Other products or brands have followers and fan clubs, one of the more well-known is the spotters club of Eddie Stobart trucks which has over 25,000 members. There is a fan club for the chocolate spread Nutella, and for the canned meat Spam. There is even a fan club for the penetrating oil WD40. Whether or not this is a case of a company seizing an opportunity, or an otherwise ordinary even dull product catching the public eye, I don’t know, but Tunnocks is in a different class. You can’t feel fondness for a truck surely. Ted Hughes, Poet Laureate 1984-98, seems to have had a soft spot for Tunnock’s Caramel Wafers. He wrote three ditties on the back of wafer wrappers and donated them to the St Andrews’ appreciation society. One of them is now in the hands of the Scottish Poetry Society. 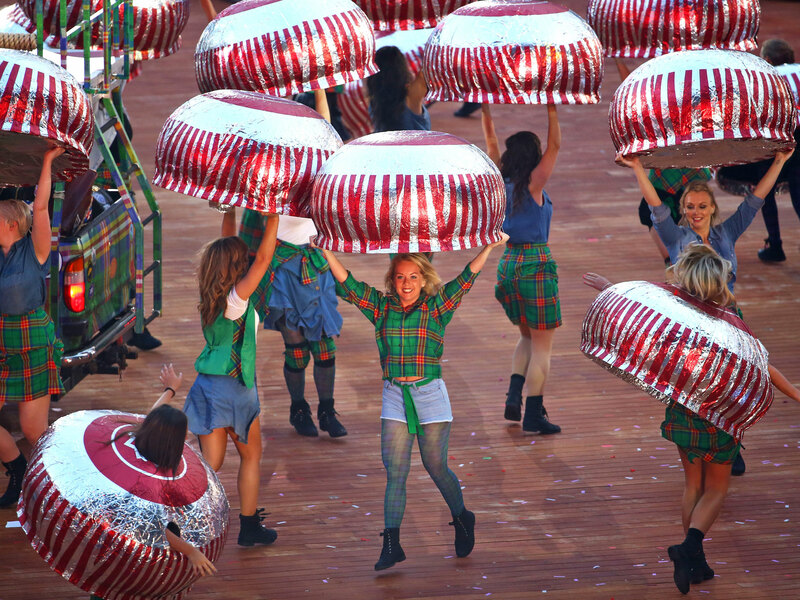 At the opening ceremony of the Glasgow Commonwealth Games on 23 July 2014, dancers dressed as Tunnock’s Tea Cakes had a starring role as they pranced around Celtic Park stadium. 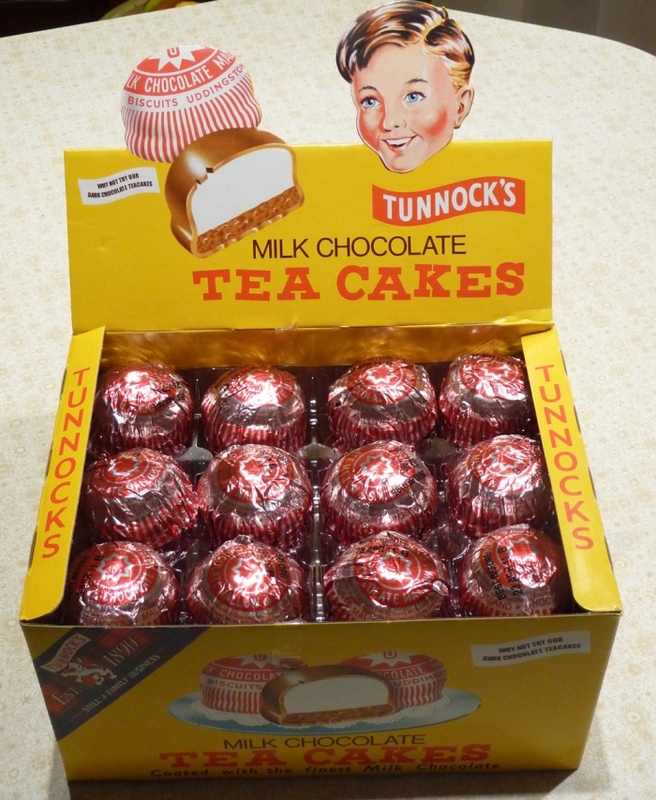 Tunnock’s Tea Cakes may have iconic status, but to me Tunnocks still sounds mildly humorous, a bit like tussocks, or the Trossachs, a range of hills north of Glasgow. It’s a catchy name, and it’s a big name. The Tour of Mull, an annual car rally held on the Isle of Mull, off the west coast of Scotland, has been sponsored by Tunnock’s since 2005. Promotional items such as teacake and wafer wrapper tea towels, aprons, cushions, tote bags, umbrellas and mugs, and even a Tunnocks truck and a van, are produced by a Glasgow-based firm, Orb. In 2013, Tunnock’s agreed that the supermarket giant, Tesco, could sell its promotional items.